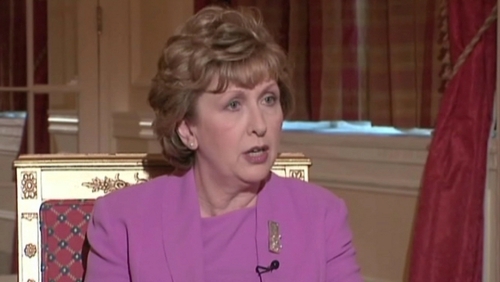 Former president Mary McAleese has said she is not troubled by the idea of gay marriage. She has also revealed that when Cardinal Bernard Law accused her of being “a very poor Catholic president” in front of dignitaries she told him it was none of his business to tell her whether she was or not. Mrs McAleese made her comments in a pre-recorded television interview with Gay Byrne. On The Meaning of Life programme, to be broadcast tonight, she reaffirmed her strong support for marriage and the family. However, she said that for centuries gay people have lived secretively, with many enduring interminable loneliness. She praised campaigners who have exposed this and who have emphasised that gay people are simply a normal human adaptation, as entitled to live on their terms as heterosexuals are to live on theirs. Ms McAleese also described her reaction to the accusation by Cardinal Law, who was archbishop of Boston at the time, that she was “a very poor Catholic president". She said that her office belonged to people of all faiths and none and that it happened to be that she was a Catholic who had tried her best to be a good one. She invited the cardinal to consider the possibility that the church lost some debates here because its opponents offered better arguments and well-educated people made up their own minds.